The factory employs 22 trained Artisan’s who produce each piece by hand in a process lasting anywhere from 2-3 weeks per piece. All artisans are local and indigenous to the region, with at least 4 generations of artisans in their families. 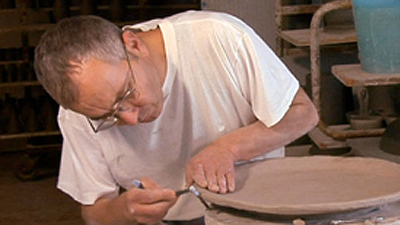 A painter must train for a minimum of 5 years and a potter for a minimum of 10 years before they can participate in the production of pieces. 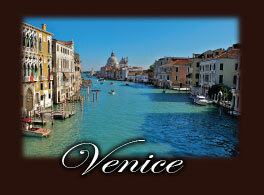 Each piece is made 100% in Italy by Italian artists that take great pride and joy in their work! The clay used to make Pietra Italia stoneware is specially selected for it's superior quality and strength. Harvested from the banks of the Tiber River, the complex mineral content of Pietra Italia clay is perfectly suited for making highly durable stoneware that can be heated to 500º or refrigerated without any ill effects. 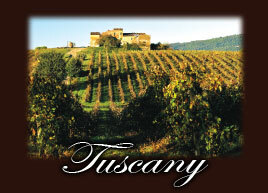 To make the perfect consistency the clay is processed with mineral water from the springs in Umbrio, Italy. This water so pure it can be used as drinking water! Before the clay is used to produce the stoneware it is extruded under pressure or hammered out by hand to remove any air pockets that might cause the pieces to crack or shatter during firing. it is ready for the wheel! 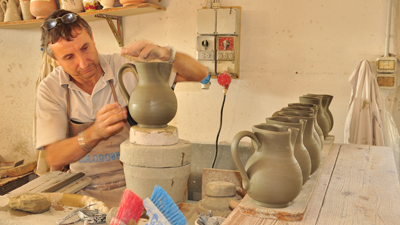 Highly skilled artisans use this high quality clay to make each piece by hand! Carafe's are "Thrown" at a potters wheel. All of the cylindrical shaped pieces are made on a potters wheel. The process is called "wheel throwing". 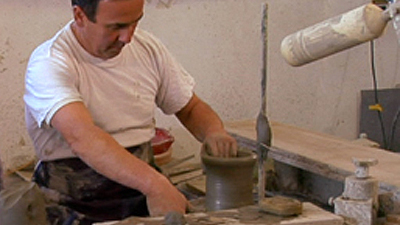 The artist starts with a lump of clay and turns it while molding the shape with their hands to form a simple cylinder. This basic form can then be molded into a bowl, a vase, a carafe, salt and pepper shakers or any other similar piece. Watching these professional craftsmen work can be deceiving because they make it look simple as the complex shapes rise from the clay like magic. What the average person does not know is that it takes 10 years of apprenticeship learning this art before an artist is allowed to make pieces for the Pietra Italia Brand! After the shapes are "thrown" any handles, attachments or modifications are made to the final piece. 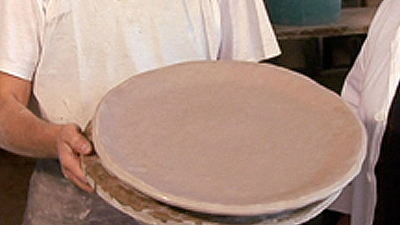 Scenic plates and dinner plates are made by hammering out the clay by hand. This piece has passed inspection! 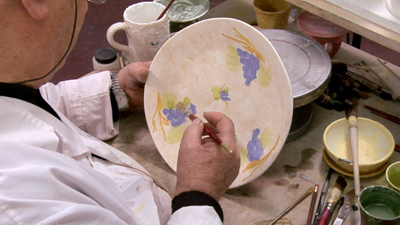 Every component of the scenic plates (including the rim and foot ) is fashioned by hand! 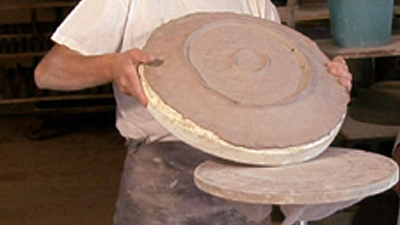 Platters, scenic plates and other shallow pieces are made by hammering out clay into a large flat disk and then pressing it onto a mold. This makes the basic shape of the dish, but the detail work like the rim and foot must be created by hand. Trimming the edges of the plate to make the rim. The final piece is ready to be fired and hand painted! Before the pieces can be painted or glazed they must be dried and kiln fired to give them strength. All the wet pieces are put aside to dry for 2-4 days. If they require a handle or other piece applied to them, they must dry for an additional 3-6 days. Once the pieces are dry they are loaded onto special carts and rolled into huge kilns where they are fired with a gradual temperature increase for 24 hours until they are bone dry and rock hard. 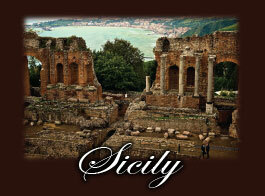 Every piece of Pietra Italia stoneware goes through no less than three firings. This time-consuming firing process adds considerable cost to the manufacturing, but the result is stoneware that can stand the test of time and hold up to wear. Loading the pieces into the Kiln. The final step is to glaze and hand decorate each piece! After the initial firing, each piece goes through several glazing steps and is hand decorated. 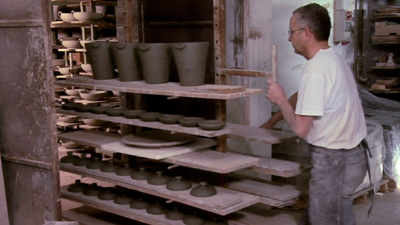 This process delivers the unique beauty and character to each piece of Pietra Italia stoneware. There is a base glaze that seals the piece, then the hand decoration and finally every piece is sealed with a coating of food safe glaze to lock in the art and allow for durable, safe surface to serve food on.